These instructions will help you prepare and format your thesis to be print ready. The size of the margins in your thesis is very important. Correct margins ensure that none of your thesis will be cut off in the printing and binding process, and it also makes the thesis look neat. 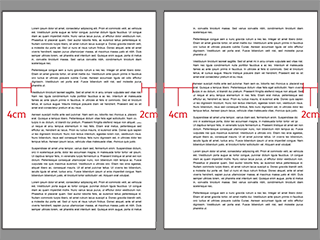 The diagram on the right shows are the standard margins for UWA thesis. As you can see, the 4cm is on the left hand side of the page (the inside edge, the side of the page that’s bound), and the 2cm goes on the right (the outside edge of the page). Standard margins for UWA thesis printed single sided. If you are printing your thesis double sided, your margins need to be mirrored. This means that for every 2nd page of your thesis, the margins need to be reversed, so it has 2cm on the inside, and 4cm on the outside. This is necessary as it’ll allow the print on the back of the double sided page to be placed away from the binding edge. See the diagram on the right to see what it should look like. So please note that the 2nd page has the margins reversed. If you want to print your thesis double sided, but you haven’t mirrored your margins, you must change the margins in your original document before submitting it to us, and the method to do so will vary depending on what program you’ve used to write your thesis. 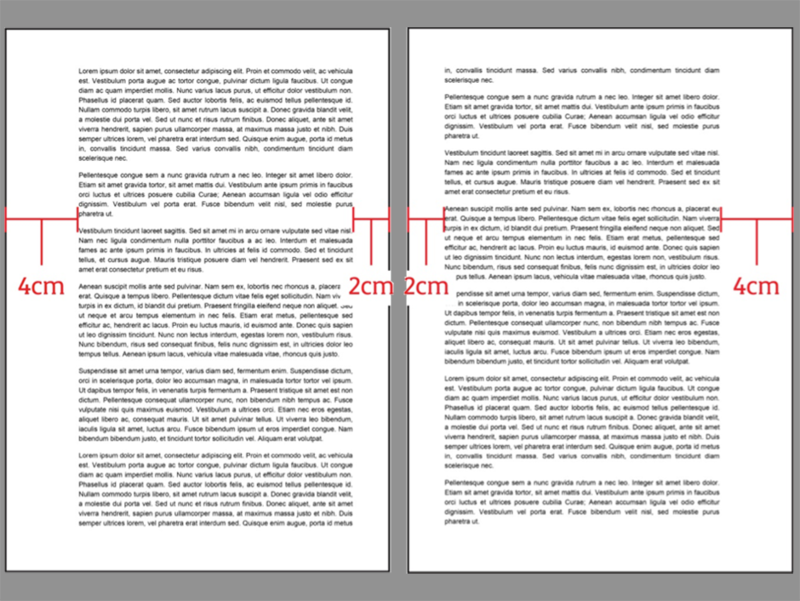 Standard margins for UWA thesis printed double sided. 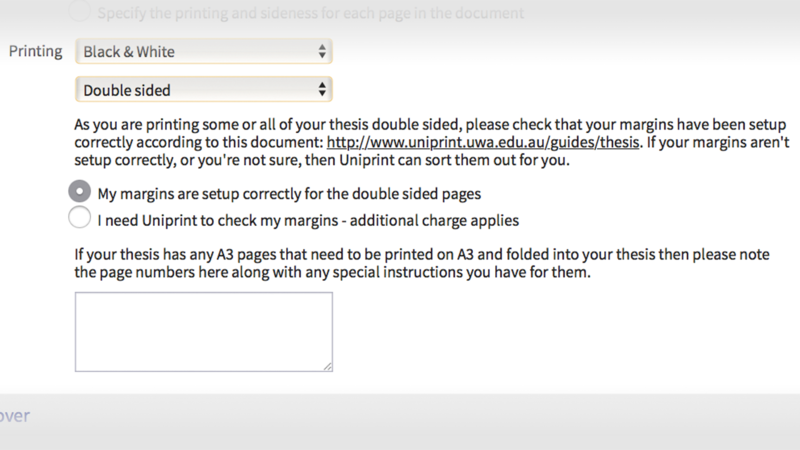 If you have issues with changing your margins to mirrored, you can either just print the thesis single sided instead (the university doesn’t have a requirement for single or double sided printing, so it doesn't matter which way you do it), or, you can select this option during the ordering process. If you select “I need Uniprint to check my margins – additional charge applies”, we will then look at your thesis and make the appropriate changes from there. Please note however that it will attract a fee, especially if a lot of the thesis needs to be changed, as well as a delay as we adjust the thesis for you by hand. We recommend that you make the changes yourself, as it’ll then make sure that from submission to completion, your thesis will be produced as correctly as possible. The rules described above also apply for landscape pages (see diagram). That is, 4cm needs to go on the top of the content of the page. 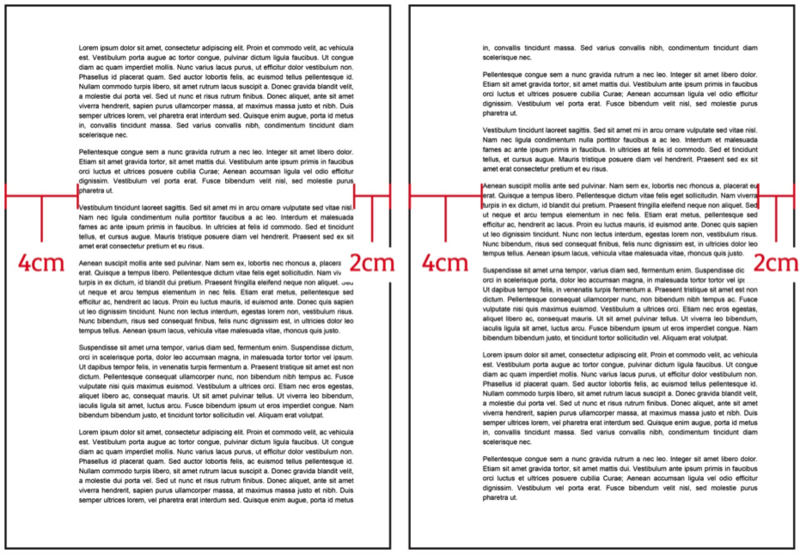 If you are printing your thesis double sided, it’s important that the margins are correct for the landscape page content. Please note that in Word, sometimes it won’t allow you to adjust the margins of the landscape pages, so they may have to be adjusted by hand, or we may need to do it for you. 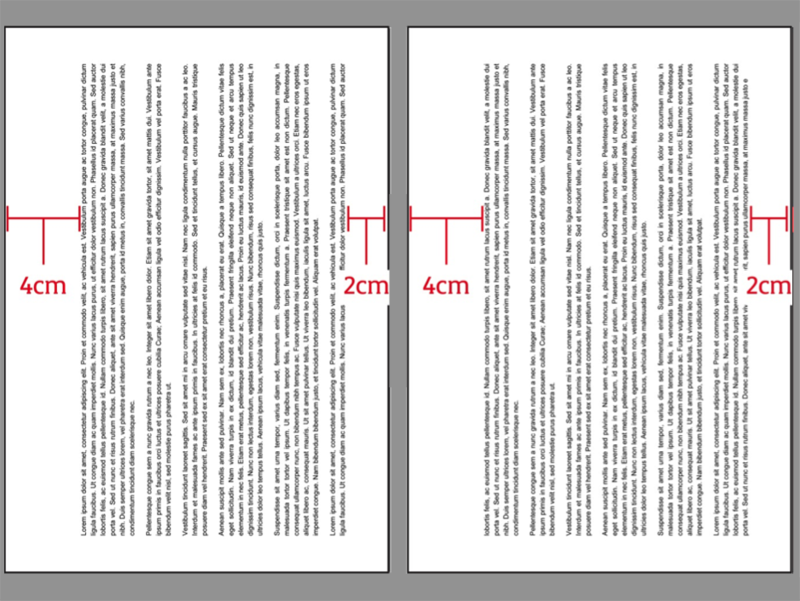 Standard margins for UWA thesis landscape pages. If you are printing your thesis double sided, you need to add blank pages to your thesis in certain locations. These blank pages make sure that the start of each chapter sits on the front of the printed page, instead of the back of the last page at the end of a chapter. 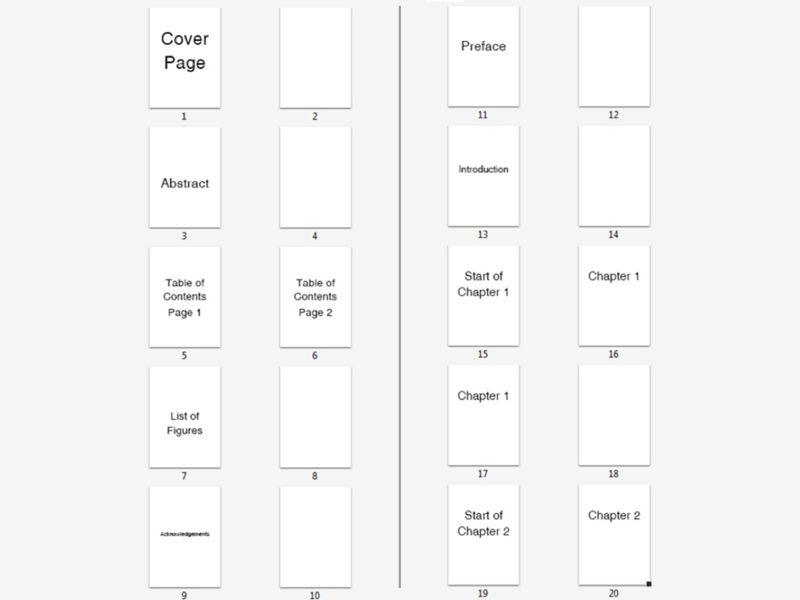 The blank pages need to be inserted typically are around the start of the thesis from the cover page to the introduction, and the start of each chapter, depending on whether the chapter starts on an odd page number or not. Refer to the charts below to see visually how blank pages should sit, or be added, to your thesis. Standard margins for UWA thesis single sided pages. 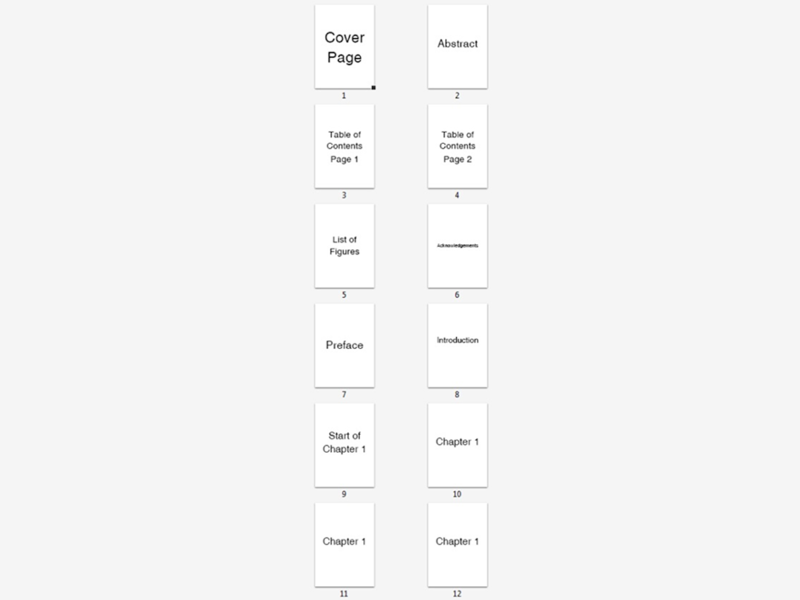 As you can see, there are blank pages after every section of the beginning of the thesis, and the start of the chapters are on odd numbered pages. Due to the complex nature of theses, and how they can be written in slightly different ways by different people, there may be portions of your thesis that aren’t covered in this guide. If you have any queries, please call 6488 3624 during business hours, or e-mail UniPrint, and we can help you.